Ruby Janell Curry Montgomery of Lexington, Kentucky, daughter of the late Howard S. Curry and Mildred Thompson Curry, was born on Saturday, July 21, 1928 in the Pierce Community of Green County, and departed this life on Tuesday, March 27, 2018 at Baptist Health in Lexington, Kentucky. She was 89 years, 8 months, 6 days of age. She attended Greensburg High School before going to Campbellsville College, where she received a Bachelor's degree in elementary education. She received a Masters and Rank 1 degree from Western Kentucky University. "Miss Ruby" was an elementary teacher for the Green County Board of Education for 31 years. During that tenure she saw many changes in education between starting her career in a one-room school house and retiring from her second-grade classroom in 1984. 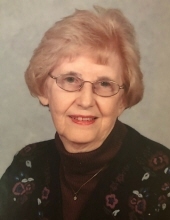 She was an active member of the Green County Democratic Women's Club, Bryan Station DAR, she had made a profession of faith in Christ and was a longtime member of the Greensburg Baptist Church. In 1995 she left her hometown of Greensburg and relocated to Lexington, Kentucky where she attended Rosemont Baptist Church. Ruby traveled 49 of the States along with several Canadian provinces. She was also an avid genealogist and co-authored a book, "Bartholomew Curry Genealogy", printed in October 1999. Survivors include a daughter and son-in-law: Patricia and Richard Potts of Lexington; three sons and daughters-in-law: Bennie and Linda Montgomery of Greensburg, David and Tanya Montgomery, and John and Kathleen Montgomery all of Lexington; eight grandchildren: Jennifer Ball of Greensburg, Sarah Lockard and her husband, Billy, Mary Elizabeth "Beth" Brockman and her husband, Scott all of Campbellsville, Richard "Chip" Potts of Tennessee, Jonathan Potts of Florida, Sean Montgomery, Donald Montgomery, and Natalie Montgomery all of Lexington; 10 great-grandchildren: Emily Ball, Alex Ball, Jackson Martin, Nick Martin, Ben Martin, Gracie Montgomery, Jacob Hayes, Noah Janes, Rien Potts, and Henry Potts; a nephew: James Howard and his wife, Joan; and a host of other relatives and friends. Ms. Montgomery was also preceded in death by her ex-husband: B.J. Montgomery; a sister: Mary Pauline Curry Patterson; a brother-in-law: Elmer Patterson, and a nephew: Larry Patterson. The funeral services for Ruby Janell Curry Montgomery will be conducted at 2:00 P.M., Central Time, Friday, March 30, 2018 at the Cowherd and Parrott Funeral Home with burial to follow in the Greensburg Cemetery. Pastor Mary Beth McCandless officiating. Visitation is requested after 10 A.M., Central Time Friday at the Cowherd and Parrott Funeral Home until time of the funeral service. Memorials are suggested to Bluegrass Hospice Care in Lexington, which can be made at the funeral home. For online condolence log onto: www.cowherdandparrott.com or Facebook. To plant a tree in memory of Ruby Janell Curry Montgomery, please visit our Tribute Store. "Email Address" would like to share the life celebration of Ruby Janell Curry Montgomery. Click on the "link" to go to share a favorite memory or leave a condolence message for the family.